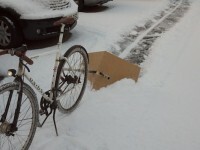 Last night's snowfall provided the perfect opportunity to convert a couple of chunks of scrap wood and the frame of my Carry Freedom Y-Frame trailer into a bike-powered snow plough... excellent! It's the end of summer and about six months since I last did any maintenance work on my much-loved, hard-abused Carry Freedom Y-Frame trailer. I've now saved 60% of the (purchase + maintenance) cost of my Carry-Freedom Y-Frame trailer as measured by mileage saved on the car!